There’s always been something about whiskey and mountains that go together. The perfect alcoholic beverage for backpacking, bourbon whiskey and it’s localized moonshine varieties have traditionally been crafted in mountain regions. 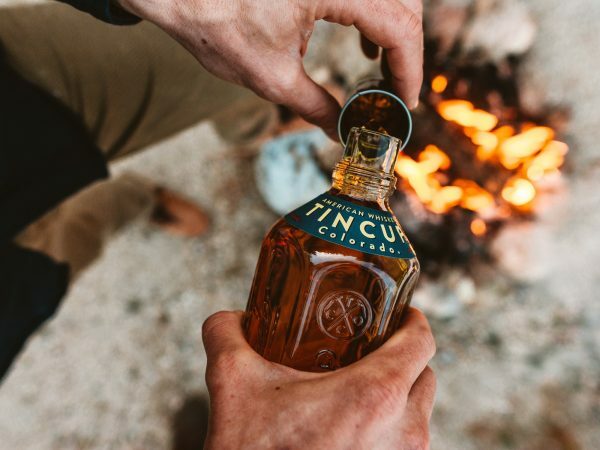 So it’s no wonder that Tincup Whiskey, made in Colorado, is self-described as “built for the outdoors.” This American Whiskey with a bourbon style has been leading the ranks of Colorado distillers for decades. So what makes it such a mountain man’s (or woman’s) whiskey? For starters, it comes with it’s own shot glass. It wouldn’t be called Tincup Whiskey for nothing. Inspired by the tin cups Colorado’s first whiskey drinkers used, the company is branded with these founders in mind. Let’s say you’re out on the trail after a long hike and you pull out your bottle of Tincup. You’ve already got your glass. Now you happen to spot a birch tree. Scrape off some bark and pop in your drink to add flavoring. Or try pine needles for aromatics. Feel like a real mountain man yet? When it’s cold and you need warming up, there’s nothing better than a hot toddy. Just combine your favorite tea pack and some Tincup Whiskey and you’ll be warm in no time. There’s nothing better than a pan fried steak over an open fire in the great outdoors. One way to make it even better is to pour about a 1/2 cup of Tincup Whiskey into the frying pan with some butter, salt, pepper and onions. Once the whiskey reduces you’re left with an amazing sauce and a tender piece of meat.